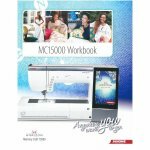 This workbook goes through detail how to use the 15000! Anyone who owns the 15000 will find it very helpful. This is a monthly class doing making towels. It is an intermediate sewing class. Come in and work on any project you would like some additional help on.